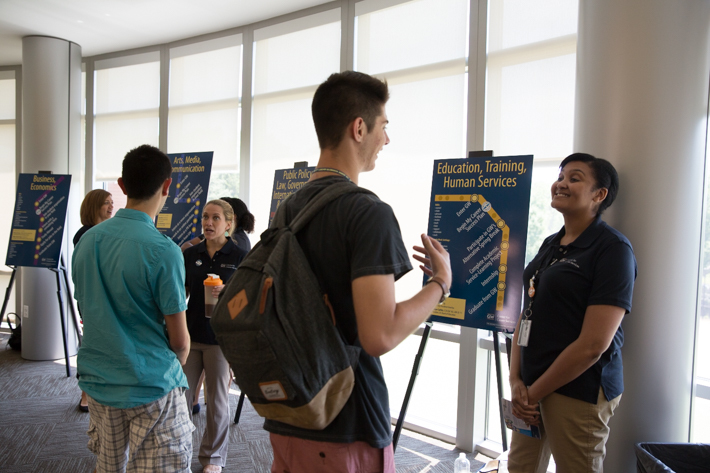 Orientation sessions offer a comprehensive introduction to life at GW for students and parents. Colonial Cabinet member talks with students and parents at check-in for Colonial Inauguration. The lights dimmed at the George Washington University Lisner Auditorium Thursday afternoon as the Class of 2019 students and their families awaited the beginning of Colonial Inauguration (CI)—and their GW journey. “Today marks the start of your first GW tradition,” GW Dean of Admissions Karen Stroud Felton said to applause at the opening session for CI. “There’s no turning back now, it’s official. You are Colonials. The three-day orientation was the first of four sessions this summer for incoming students and their families to learn about GW’s academic programs, student and parent services and life in D.C. A high-energy student-group—dubbed the Colonial Cabinet—and staff and faculty from across the university offer a guided introduction to life at GW. Members of the Class of 2019 learned about academic paths at GW that will prepare them for future careers. The experience is a whirlwind tour of GW from class registration and guest faculty lectures to campus safety, student organizations, sustainability, athletics, academic opportunities and career services. Highlights include GW traditions such as the Buff and Blue BBQ on the Mount Vernon Campus, a performance by the Capitol Steps comedy troupe and a student performance showcase. The Class of 2019 has just over 2,500 students from 47 states and 40 countries, according to Ms. Felton. CI also helps students think through issues they could face while attending college, according to Chelsea Truesdell, who joined the university last summer as assistant director of administration and hallmark programs and director of CI. 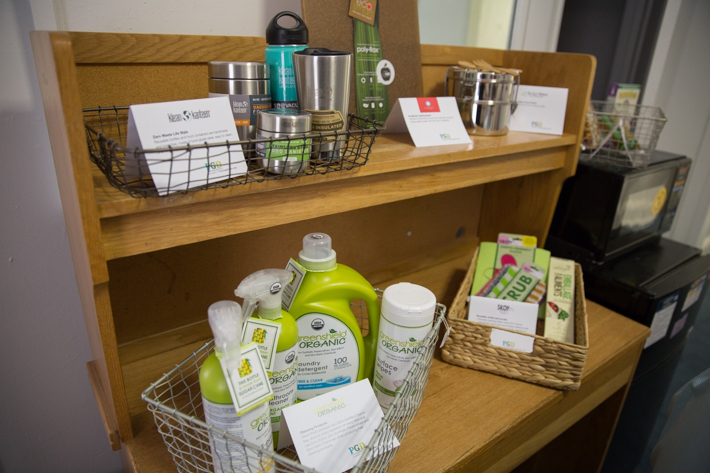 Residence hall rooms were staged to showcase sustainable practices with items donated by Turning Green through a partnership with the Office of Sustainability and GW Housing. Model rooms will be set up during all four sessions. During “Scenes from College Life,” the 33 Colonial Cabinet members presented a series of skits depicting resolutions to common problems such as roommate disagreements, health issues and academic stress. Information sessions on Title IX and sexual assault were also added this year to reflect the changing issues that affect college students nationally, Ms. Truesdell said. Student Association President Andie Dowd urged incoming freshmen to take a deep breath, relax and use the college experience to try new activities, explore academics and connect with fellow classmates. CI also gave new GW families an opportunity to prepare for their student’s transition to college life with sessions designed specifically for them. They also had the opportunity to meet with Rodney L. Johnson, executive director of the Office of Parent Services. Mr. Johnson will retire this summer. 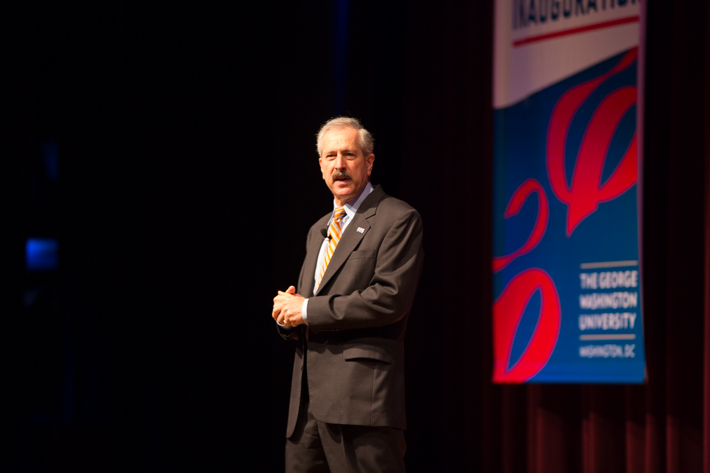 Provost Steven Lerman urged incoming freshman to use their studies to find a a vocation in a field for which they are passionate. “When parents leave campus at the end of CI, I want them to feel confident that their son or daughter made a great choice in attending GW,” Mr. Johnson said. For Stewart Todd, B.A. ‘93, 2015 CI will mark a different type of transition—from proud alumnus to GW parent. Mr. Todd was a member of the first Colonial Cabinet and this summer his son Alex will attend the second session of CI as an incoming freshman. Mr. Todd said his fondest memories of CI are of the strong relationships he built with fellow cabinet members. “I think we were all also cognizant of the impact that the program could have on the students coming to GW,” Mr. Todd said. “We tried to design and deliver a program that would help all incoming students be a little more prepared for what lay ahead. 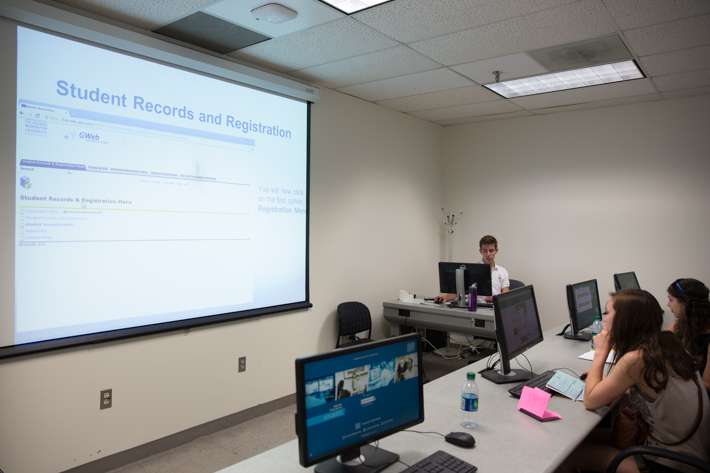 A major component of CI is guiding students through their first academic class registration, a milestone for incoming freshman. Similar to many incoming freshman, Alex Todd is ready to take those first steps to college life and a future career.